For its financial year ending 31 January 2017 Astro Malaysia has seen e-commerce and Adex driving growth in revenue and Profit after Tax and Minority Interests. The group saw Adex growth of 13% YoY to RM524million while Astro’s share of TV Adex and Radex rose to 37% and 73% respectively. Average revenue per user (ARPU) grew 0.6% YoY to RM99.9 underpinned by higher take-up of value added products and services. Meanwhile, the decrease in earnings before interest, taxes, depreciation, and amortisation is mainly due to investment in key sports content and currency depreciation impacting content costs, said the company. Dato’ Rohana Rozhan, group chief executive officer of Astro said the company is seeing growth in its reach and engagement across all our platforms. Its TV service reaches 70% of Malaysian households at 5million. Astro on the Go (AOTG) also saw its registered users increase to 1.1million (+ 31% YoY) and an average viewing time of 130 minutes weekly. Its On Demand service is registering 600k video downloads per month. Currently Astro’s social media platforms engages 5.1million unique viewers monthly. 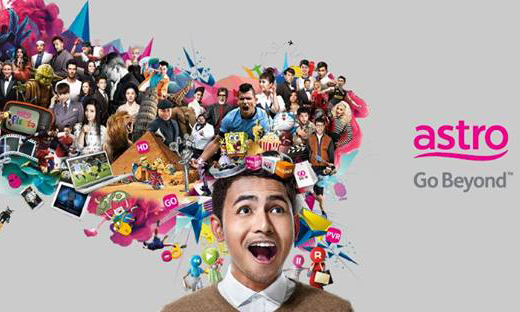 Astro Gempak, the Malay entertainment platform, has an audience of 1million audience and a total of 625.5mn total views. The group saw TV viewership share rise 1% to 77%. Going forward it will continue to focus on original signature IPs, local and ASEAN movies, same day/date global windows, live music events and sports such as Premier League, La Liga and F1 as well as e-sports, international movies, Korean entertainment and an increasingly digital content and socialisation. Astro’s Go Shop continues to grow from strength to strength, serving 691k customers (+61% YoY) with revenues of RM201mn in 9MFY17 – an increase of 59% YoY. To further extend Go Shop’s reach and scale, it has partnered with StarHub Cable Vision in SIngapore to launch its e-commerce service to serve 5.5 million Singaporeans. Astro is also ideating digital content preferred by the millennials. In collaboration with PGL, eGG Network successfully organised Malaysia’s first multilingual e-sports championship, “Counter Strike: Global Offensive (CS:GO) Minor Championship Asi”a in October 2016, where the tournament was broadcast on OTT platforms globally in six languages, attracting 1.5 million unique viewers. Tribe OTT service is on course to build a community for the millennials in the region with its December launch in the Philippines, following its launch in Indonesia in March 2016. Through its partner in the Philippines, Globe Telecoms, Tribe aims to create an immersive experience for different fandoms and connect them with their own ‘tribe’. According to Astro, it recognises that digital has brought about unprecedented democratisation of consumer choice, and has advanced its digitalisation aspiration across its platforms, products and services, as well as in building up its analytics capabilities and customer intelligence, to better serve its connected and mobile customers. Astro is working with Amazon Web Services to migrate our enterprise workload to the cloud, increasing our agility and scalability to meet new customer demands while at the same time, inculcating a strong innovation culture within our group. “All our digital services are now accessible on mobile devices. With the launch of the new and improved Astro on the Go this month, all Astro customers can look forward to an improved intuitive user interface and more personalised features,” she added. Now with five core services (Experience, Digital, Content, Creative, and Integrated Marketing Communication) and a team of 70, Tea..